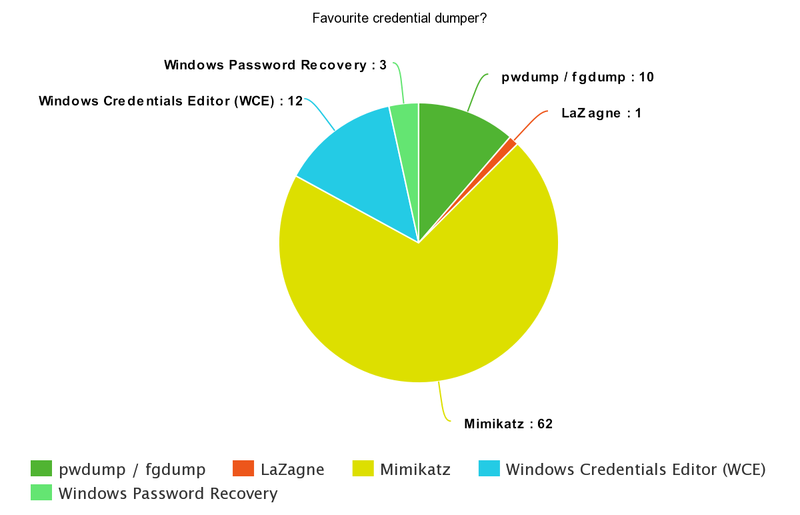 In my last blog post, I decided to create a survey as to get a better perspective on popular or favourite tools of attackers, red teamers and/or pentesters. 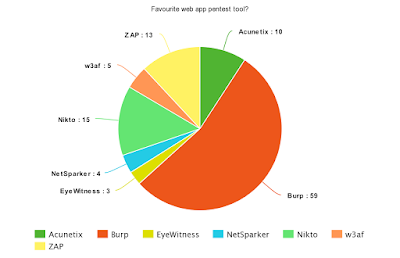 Below I present the results, with additional & minimal commentary from my side. Comments are below the figures. Note this is not fully indicative of an attacker or threat actor's arsenal, but I do hope it can give anyone some pointers. Enjoy the journey. Yes, you may use this data as long as you mention the original source, which is this exact blog post. You may find a direct SurveyMonkey link to the results here. First and foremost question: what do you do? Are you a red/blue or purple teamer? Or no idea at all? 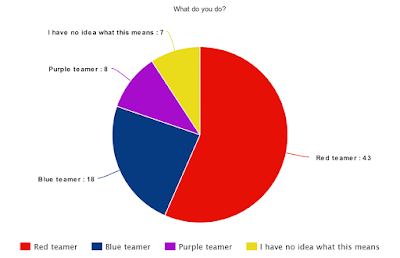 The Difference Between Red, Blue, and Purple Teams. Bypassing AV can be interpreted quite broadly, but let's say using the most well-known tools with ability to evaded AV - with which Metasploit takes the lead, and Veil a close second. 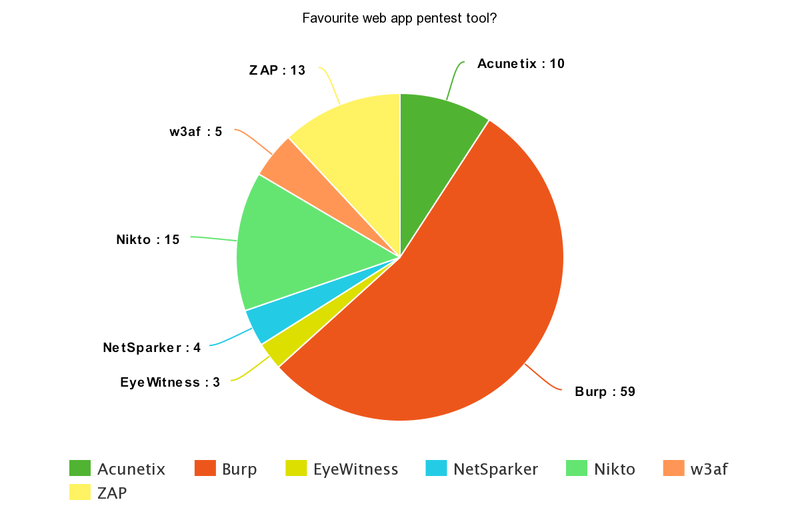 Burp seems to have the biggest share of being most popular or used web app pentest tool. This is definitely one of the, if not the most, interesting results of all questions. 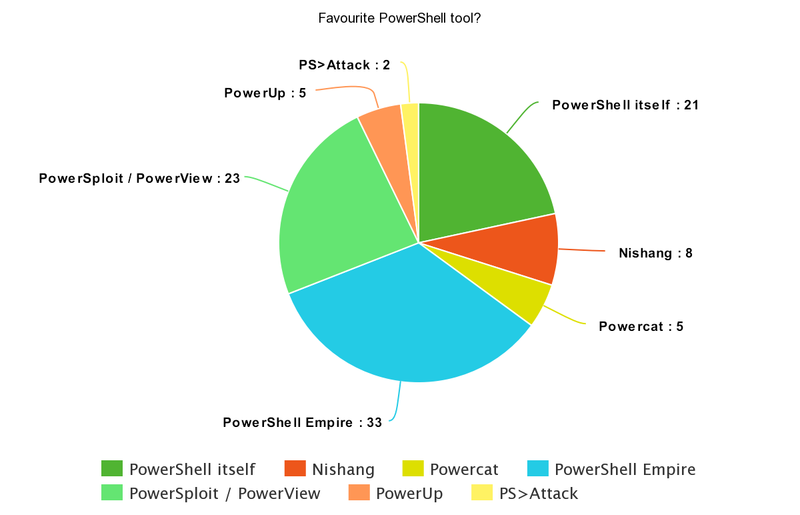 PowerShell Empire takes the lead, with PowerSploit following very closely... And not too far off is PowerShell itself. Draw your conclusions. Mimikatz seems to be the most preferred credential dumper all around. 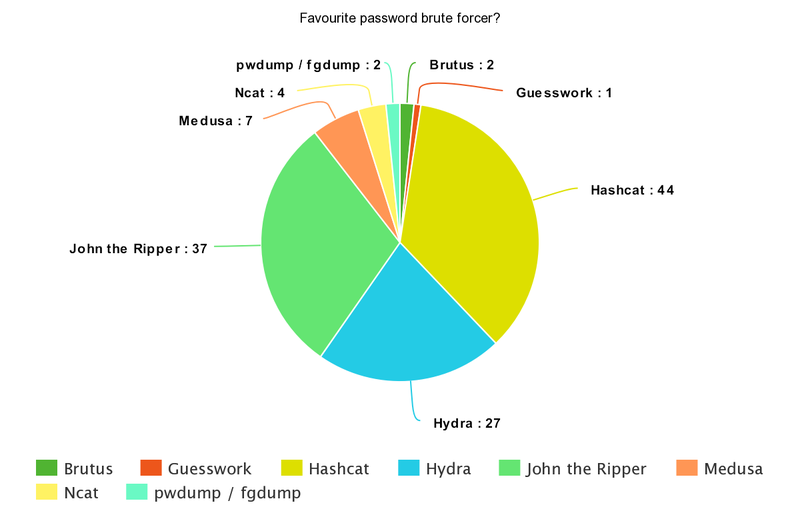 Hashcat, Hydra and John the ripper rank among the top three of password brute forcers. This question and the next overlap slightly - if an attacker doesn't (or can't) build custom malware, they may be more inclined to use RATs (freely available or not). 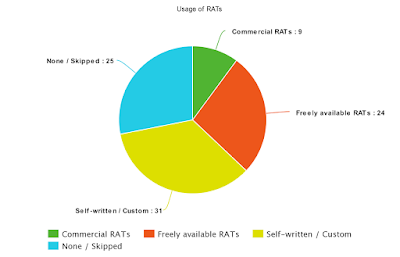 Building a RAT is definitely more trivial than building or writing custom malware. However, don't be fooled. If an attacker is strongly motivated, it's not a question of if they'll get on the network, but when. Take appropriate defensive measures. I can definitely recommend you to check out Casey Smith's Catalog of Application Whitelisting Bypass Techniques. PowerUpSQL, CrackMapExecWin, smbexec, PowerSCCM, Kerberoasting, CobaltStrike (after obtaining admin creds for another system), WMI, Password reuse. PS Empire, PEspin, Shellter, Unicorn.py and even manually. Compress-File.ps1, BloodHound, PowerLurk, PowerSkype.ps1, PowerOPS, PowerForensics, Unicorn.py. Nmap NSE "brute"-category scripts, patator, Invoke-SMBAutoBrute.ps1, HashcatOCL. Empire, Meterpreter (Metasploit), ADC2.ps1, ThinkPwn, manwhoami/Bella, tinymet/Ultimet, CobaltStrike beacons. You may wonder if every attacker will use every tool on this list. They may well do so, or not use any of the tools and scripts discussed at all, and rather write everything tailored to your environment. Also keep in mind that an attacker's TTPs may change over the course of weeks, months or even years. However, some tools will always be popular and withstand the test of time. I definitely advise you to either subscribe to feeds, or follow people on Twitter - both red teamers and blue teamers. Often, they both provide a unique insight which in turn will help you to defend better as well. Don't hesitate to share your findings with the community! Try to think like an attacker. Leave nothing out. Know your own environment. I additionally advise you to check out Matt Swan's Incident Response Hierarchy of Needs. If you like hierarchies or pyramids. definitely check out the threat intelligence Pyramid of Pain by David Bianco. There's also a good paper on detecting lateral movement in Windows infrastructure by CERT-EU. Still in doubt? Start Googling some of the TTPs mentioned above and check out their functionality - and shortcomings! What about PowerShell and all its misuses? 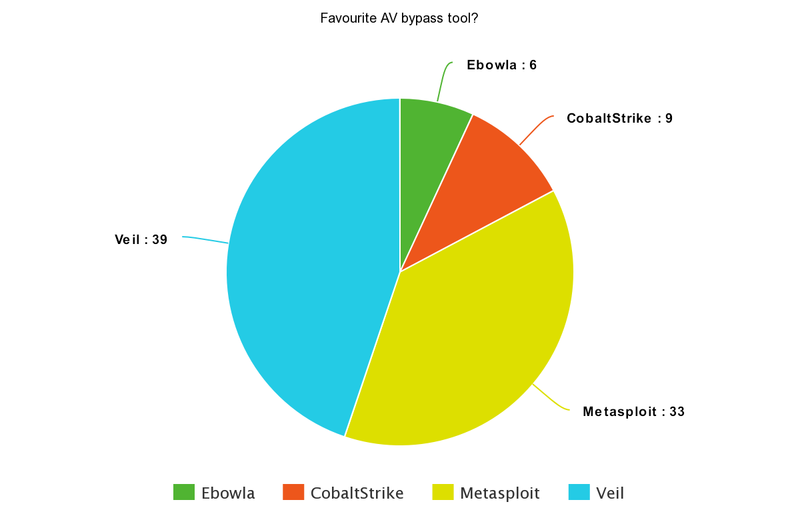 What about AV and how it can be bypassed? AV should never be your only layer of protection. Next-gen or not. Where there are attackers, there are defenders and vice versa. Use Event Logging. Use Sysmon. I'm a red teamer, where can I find more information? Can I use this data? Of course! As long as you mention the original source, which is this exact blog post. You may find a direct SurveyMonkey link to the results here. Thanks to all the participants, and to you for reading! Please do comment with your feedback or questions or anything else you would like to discuss.